More often that not we hear stories of success, of how people have done remarkable things, or become remarkable people. But we don't often share stories on failure. And more importantly, the golden nuggets that come from the experience of failure. That's why we're throwing our April event. 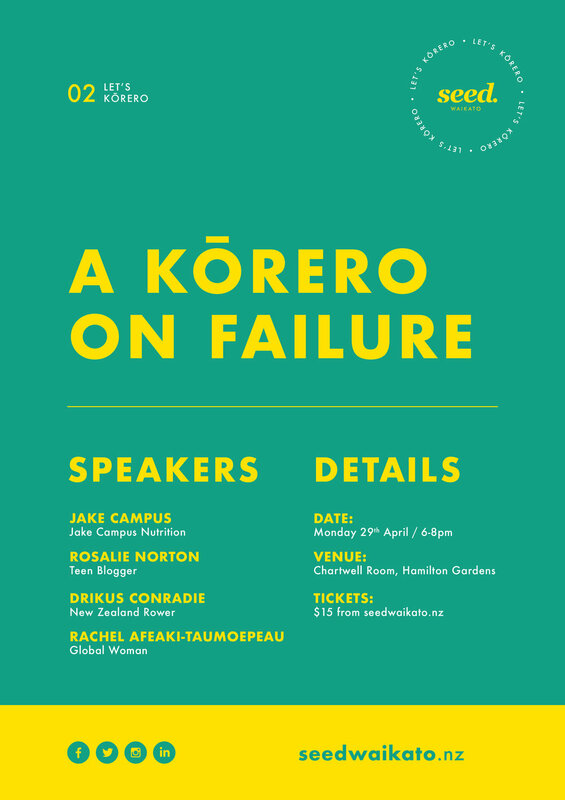 To bring a community of people together to hear inspiring, challenging and encouraging stories on failure in all its glory to remind us that the road to epic stuff is filled with ups and downs. If you're a tradie, creative, entrepreneur, professional, student, parent, volunteer, freelancer or anything in between, our events are a place for you to connect with new people, find inspiration, and learn something new. If you purchase a pay-it-forward ticket, we will organise for this to go to someone who needs it. No matter what your religion, ability, sexual orientation, gender, ethnicity OR financial means, if you want to join us at this event, we would love to see you there. That’s why if you can’t afford the ticket price, please drop us an email to seedwaikato@gmail.com and we can organise a pay-it-forward ticket to get to you! Drikus Conradie has had a rowing career that many young athletes dream of. While Drikus prides himself in this, his primary focus are the areas in life and sports that he can learn and grow from. One of his most successful feats, is stroking the fastest New Zealand men’s eight in history. An accumulation of years of hard work, failure, and learning. He attributes his success to the crew of men around him and his ongoing desire to never stagnate. In the last year Drikus has focused on his career and now provides strategy solutions for businesses in our local community. Drikus dreams of making substantial improvements to the culture of health and performance in our society. Rachel has a strong background in international trade relations and development within central government working with senior management from the Ministry of Foreign Affairs and Trade, Ministry for Pacific Peoples and regional economic agencies to include: Pacific Trade Invest NZ, Pacific Cooperation Foundation and New Zealand Trade and Enterprise. She has international governance experience working across small island state nations: Tonga, Samoa and the Cook Islands and countries within Asia, Africa, North America and South America. Currently the Interim Chairperson for the Pacific Business Trust – is currently working the government to transition into the first mandated Pacific National Economic Agency July 01 2019. The Pacific Business Trust will deliver the Inaugural Pacific Social Enterprise Summit 18th June in Auckland where pacific social enterprises across NZ and the pacific region will be invited to attend, engage, discuss and deliver solutions for Pacific peoples and contribute to NZ society. Rosalie Norton is a 14 year old high school student who loves getting involved with her community through performing and volunteer work. She proud of how far she come with having her own blogging website where she shares her experiences with Anxiety and being a teen in general. She hopes to inspire other teens through her work to always live a true authentic life and to push through any hurdle with confidence and positivity. Jake Campus is a born and bred Hamiltonian, one of New Zealand’s most successful ever body builders and owner of one of the country’s largest nutrition businesses, Jake Campus Nutrition. He has over ten year’s experience in the industry and hundreds of clients all over the world from your general population through to elite athletes. Jake recently launched a line of merchandise including his own recipe book and a range of ready to eat nutritionist approved meals. His most recent project will see him bringing the international WBFF body building federation to New Zealand for the very first time in October.